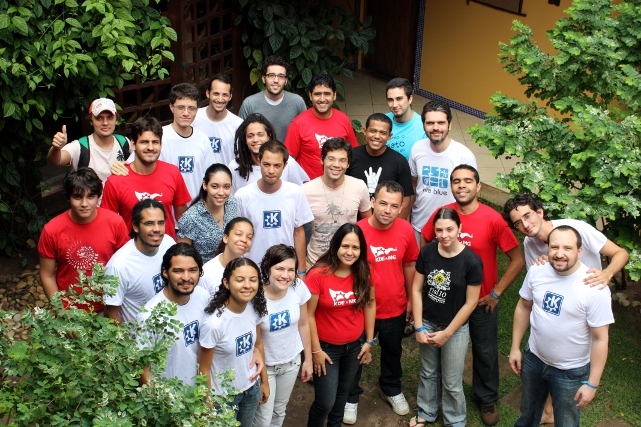 We were just a bunch of nice-looking guys and girls :) hanging wifi routers over the windows and trying not being intimidated by an unceasing rain when we had the Brazilian KDE Summit (Akademy-BR) in Praia do Forte (BA) back in 2010. This was somehow the birth of LaKademy (Latin-American KDE Summit), started in 2012 and now having its fifth edition taking place in Belo Horizonte (Minas Gerais) from 29th April to 1st May. LaKademy is an effort to promote the culture of FLOSS, hacking sessions, and collaborative work inside the Latin-American KDE community. It is also a way to let people know about the Brazilian/Latin-American KDE community, the sort of work we usually do, and how newcomers can start their journeys into the free software world. And, of course, is the place to strengthen relationships, make new friends, and let people fall in love about such an amazing FLOSS community <3. Sixteen contributors will attend LaKademy 2017, interested in contributions to translation, promo, artwork, Atelier, Umbrello, KDE-Edu, Dolphin, KDE Games, KDevelop, and Kdenlive. The traditional LaKademy promo meeting will happen on 30th morning, where we make a retrospect of 2016 actions and start thinking about what we want to do for 2017/2018.